RamRock Building Systems, LLC, makes masonry products from non-toxic industrial waste, such as roofing shingles. This demonstration shows how the blocks fit together to make a wall that can be covered behind traditional building materials. This photograph was taken Tuesday, Jan. 13, 2015, in Chattanooga, Tenn. The driving force: David White, 65, is RamRock's CEO, a one-man show, considering he's technically the only employee. Work is contracted out as needed. He has a bachelor's degree from the University of Virginia and served as a coordinator for the second annual World Congress of the Zero Emissions Research Initiative held in Chattanooga in 1996. 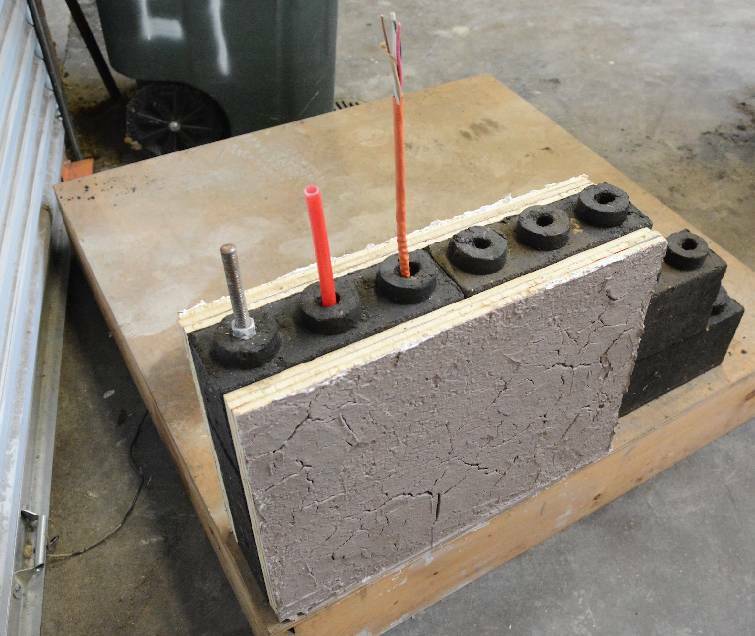 About the company: The Chattanooga company's trademarked RamRock technology uses hydraulic compression to ram urban-industrial waste into rock-hard interlocking blocks and related building products. The final products can be worked by a lay person and do not required masonry skills; the company will offer proprietary software that specifies in advance the number and location of every block and block type to build. RamRock is working with Colorado-based Qest Corporation on a master licensing agreement. The pitch: RamRock has raised $600,000 from individual investors. It's looking for up to another $1 million to build its second proof of concept and move into the residential real estate market. RamRock Building Systems is all about waste: industrial solid waste, to be specific, and making it into something that serves a purpose. Using hydraulic compression, the Chattanooga company's technology aims to take discarded demolition and construction material and turn it into interlocking building blocks. "They stack up like Legos," said David White, RamRock's co-founder and CEO. Those blocks can form walls for all kinds of building types. The company expects to start in the residential construction market. The blocks don't demand experienced brick-layers. They can "be laid by unskilled day laborers, volunteers and do-it-yourselfers," White said. White says that RamRock, as the building block material is also called, is "highly resistant to fire and wind damage, insect infestation, sound infiltration and projectile penetration." He also points out that it's sustainable because it uses no wood and is recycled. "The simplicity of the RamRock installation process is a key factor in our value proposition, which is to be the highest-performing building system on the market, while costing no more than conventional concrete block and wood-frame," White said. He didn't provide any financial details. The company formed four years ago when a small group of local investors saw the potential of the proposed technology and agreed to fund the initial proof of concept. In 2012, using construction and demolition debris, they created a small demonstration building. "For us, this is not rubble, this is raw material," White said. Now RamRock is working on a final proof of concept before moving to commercialization early next year. It's gearing up to build its first production block fabricator. "We are committed to being a sustainability juggernaut here in Chattanooga and elsewhere across the country and around the world," White said. "RamRock's motto — 'Earth Friendly. Human Kind. '— tries to capture this, our hope being that the market will respond in kind."